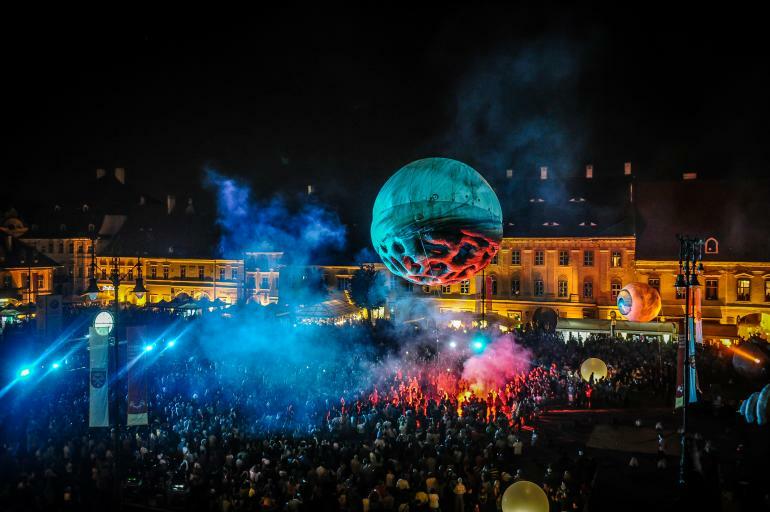 Rochester, NY – The 2017 KeyBank Rochester Fringe Festival (Thursday, September 14 – Saturday, September 23) will present France’s Plasticiens Volants in its U.S. premiere to headline Friday and Saturday on the Fringe on September 15 & 16. The 2017 KeyBank Rochester Fringe Festival will present BIG BANG as its spectacular, FREE, outdoor headliner at Parcel 5 (285 E. Main St.) on September 15 & 16 at 8 p.m. as part of its annual Friday and Saturday on the Fringe (rain date: September 17). More about Fringe: Now in its sixth year, the newly renamed KeyBank Rochester Fringe Festival has become one of the most successful fringe festivals in the U.S., attracting more than 68,000 attendees in 2016. This 10-day, multi-arts festival now boasts over 500 performances and events –a third of which are free – in 25+ venues in downtown Rochester, NY. Celebrating and inspiring creativity, the “Fringe” – which is partially curated by the festival and partially by festival venues – includes everything from theatre, music, comedy and dance, to children’s entertainment, spoken word, visual arts and much more. Rochester Fringe Festival is a not-for-profit, 501(c)(3) corporation that exists as a means to connect venues, performers, artists, educational institutions and the audience. It was pioneered by several of Rochester’s esteemed cultural institutions, including Geva Theatre Center, the George Eastman House and Garth Fagan Dance, as well as up-and-coming groups like PUSH Physical Theatre and Method Machine. The Board of Directors includes representatives from the University of Rochester, Rochester Institute of Technology, Bond Schoeneck & King PLLC, Boylan Code LLC, the Eastman School of Music, Mengel, Metzger and Barr & Co. LLP, Method Machine, PUSH Physical Theatre, and Writers & Books. The Rochester Fringe Festival is made possible by the New York State Council on the Arts with the support of Governor Andrew M. Cuomo and the New York State Legislature. This festival is also supported by a grant Empire State Development’s I LOVE NEW YORK program under Governor Andrew M. Cuomo&apos;s Regional Economic Development Council Initiative. Additional 2017 Fringe sponsors include: KeyBank; New York State Council on the Arts; University of Rochester; Rochester Area Community Foundation; Elaine P. & Richard U. Wilson Foundation; RIT; Ames Amzalak Memorial Trust; National Endowment for the Arts; Gouvernet Arts Fund at the Rochester Area Community Foundation; City of Rochester; Monroe County; Bond, Schoeneck & King LLP; Boylan Code LLP; Mengel, Metzger, Barr & Co. LLP; Wegmans; Nocon & Associates; Ronald Fielding; SUNY Geneseo; The Pike Company; Mary S. Mulligan Trust; the Max & Marian Farash Charitable Foundation; 13-WHAM; CITY Newspaper; Democrat & Chronicle Media Group; East Avenue Inn & Suites; Broccolo Tree & Lawncare; McCarthy Tents & Events; Daisy Marquis Jones Foundation; The Rubens Family Foundation; The Wilson Foundation; the College at Brockport; Nazareth College; St. John Fisher College; Visit Rochester; Genesee Beer; City Blue; WXXI; Yelp! ; and KidsOutandAbout.com. Media please note: high-resolution images and broadcast-quality video of Plasticiens Volants are available at BIG BANG press assets. Fringe press assets, including 2016 photos, press releases, previous photos, videos and more, are available at rochesterfringe.com/press. Interviews can also be arranged. Please visit rochesterfringe.com for more information.